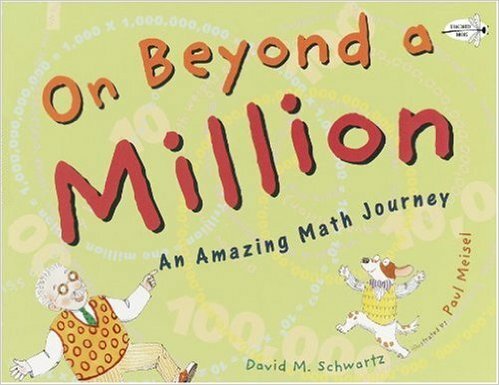 Professor X and his dog, Y, teach kids how to count exponentially by powers of 10 (1, 10, 100, 1,000, 10,000, etc. ), beginning at 1 and working all the way up to a googol (a 1 followed by 100 zeros) and beyond. Children fascinated by large numbers will be amazed how quickly they can count to really BIG numbers, and they’ll also find answers to questions like “What comes after a trillion?” or “What’s the biggest number in the world?” Real-life examples provide plenty of fun facts, such as how much popcorn Americans eat in one year, or how many hairs are on a square inch of a person’s head. Along with the fun comes some powerful learning, as this unique counting book helps kids understand our number system, which is based on multiples of 10.